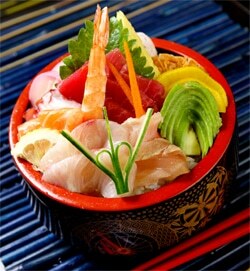 Chirashi sushi, meaning scattered sushi, is a style of sushi where the topping is placed in a bowl over a bed of rice. Commonly, nine toppings are used (nine is a very important number in Japanese culture), however you can certainly use how ever many are available to you. Follow the instructions as though you were making sashimi and simply place the pieces on top of the bed of rice. If you can, find a nice Japanese bowl, it will greatly enhance the presentation, but is not necessary. Depending on the size of the bowl, fill it approximately half full of rice, keeping it well aerated. Place the garnishes inside towards the edges and then the ingredients of your choice. Care is given to the presentation; placing the items just so, adding shiso, daikon, or whatever garnishes are chosen, and making the dish as attractive as possible. The garnishes serve to beautify the dish as well as being functional, as gari (ginger) is a great palate cleanser between sushi items as the flavors may be subtle. Think ‘work of art’ and you will get the idea. But don’t hesitate to use your imagination with the design, and to dig in when served. The first experience when served chirashi sushi is the presentation, the second is the eating. Looking for sushi-grade fish and other seafood online? Catalina Offshore Products has the best sushi grade seafood available, in my opinion. Visit Catalina Offshore Products for almost everything you could ever want.